In mythology, the Greek underworld is an otherworld where souls go after death. The original Greek idea of afterlife is that, at the moment of death, the soul is separated from the corpse, taking on the shape of the former person, and is transported to the entrance of the underworld. The underworld itself—sometimes known as Hades, after its patron god—is described as being either at the outer bounds of the ocean or beneath the depths or ends of the earth. It is considered the dark counterpart to the brightness of Mount Olympus with the kingdom of the dead corresponding to the kingdom of the gods. Hades is a realm invisible to the living, made solely for the dead. There are six main rivers that are visible both in the living world and the underworld. Their names were meant to reflect the emotions associated with death. In front of the entrance to the underworld live Grief (Penthos), Anxiety (Curae), Diseases (Nosoi), and Old Age (Geras). Fear (Phobos), Hunger (Limos), Need (Aporia), Death (Thanatos), Agony (Algea), and Sleep (Hypnos) also live in front of the entrance, together with Guilty Joys (Gaudia). On the opposite threshold is War (Polemos), the Erinyes, and Discord (Eris). Close to the doors are many beasts, including Centaurs, Scylla, Briareus, Gorgons, the Lernaean Hydra, Geryon, the Chimera, and Harpies. In the midst of all this, an Elm can be seen where false Dreams (Oneiroi) cling under every leaf. The souls that enter the underworld carry a coin under their tongue to pay Charon to take them across the river. Charon may make exceptions or allowances for those visitors carrying a certain Golden Bough. Charon is appallingly filthy, with eyes like jets of fire, a bush of unkempt beard upon his chin, and a dirty cloak hanging from his shoulders. Although Charon embarks now one group now another, some souls he grimly turns away. These are the unburied which can't be taken across from bank to bank until they receive a proper burial. Across the river, guarding the gates of the underworld is Cerberus. There is also an area where the Judges of the underworld decide where to send the souls of the person — to Elysium, the Fields of Asphodel, or Tartarus. While Tartarus is not considered to be directly a part of the underworld, it is described as being as far beneath the underworld as the earth is beneath the sky. It is so dark that the "night is poured around it in three rows like a collar round the neck, while above it grows the roots of the earth and of the unharvested sea." Tartarus is the place that Zeus cast the Titans along with his father Cronus after defeating them. Homer wrote that Cronus then became the king of Tartarus. While Odysseus does not see them himself, he mentions some of the people within the underworld who are experiencing punishment for their sins. In the Aeneid, the Mourning Fields (Lugentes Campi) was a section of the underworld reserved for souls who wasted their lives on unrequited love. Those mentioned as residents of this place are Dido, Phaedra, Procris, Eriphyle, Pasiphaë, Evadne, Laodamia, and Caeneus. The Fortunate Isles or Isles of the Blessed were islands in the realm of Elysium. When a soul achieved Elysium, they had a choice to either stay in Elysium or to be reborn. If a soul was reborn three times and achieved Elysium all three times, then they were sent to the Isles of the Blessed to live in eternal paradise. Hades (Aides, Aidoneus, or Haidês), the eldest son of the Titans Cronus and Rhea; brother of Zeus, Poseidon, Hera, Demeter, and Hestia, is the Greek god of the underworld. When the three brothers divided the world between themselves, Zeus received the heavens, Poseidon the sea, and Hades the underworld; the earth itself was divided between the three. Therefore, while Hades' responsibility was in the underworld, he was allowed to have power on earth as well. However, Hades himself is rarely seen outside his domain, and to those on earth his intentions and personality are a mystery. In art and literature Hades is depicted as stern and dignified, but not as a fierce torturer or devil-like. However, Hades was considered the enemy to all life and was hated by both the gods and men; sacrifices and prayers did not appease him so mortals rarely tried. He was also not a tormenter of the dead, and sometimes considered the "Zeus of the dead" because he was hospitable to them. Due to his role as lord of the underworld and ruler of the dead, he was also known as Zeus Khthonios ("the infernal Zeus" or "Zeus of the lower world"). Those who received punishment in Tartarus were assigned by the other gods seeking vengeance. In Greek society, many viewed Hades as the least liked god and many gods even had an aversion towards him, and when people would sacrifice to Hades, it would be if they wanted revenge on an enemy or something terrible to happen to them. Persephone (also known as Kore) was the daughter of Demeter, the goddess of the harvest, and Zeus. Persephone was abducted by Hades, who desired a wife. When Persephone was gathering flowers, she was entranced by a narcissus flower planted by Gaia (to lure her to the underworld as a favor to Hades), and when she picked it the earth suddenly opened up. Hades, appearing in a golden chariot, seduced and carried Persephone into the underworld. When Demeter found out that Zeus had given Hades permission to abduct Persephone and take her as a wife, Demeter became enraged at Zeus and stopped growing harvests for the earth. To soothe her, Zeus sent Hermes to the underworld to return Persephone to her mother. However, she had eaten six pomegranate seeds in the underworld and was thus eternally tied to the underworld, since the pomegranate seed was sacred there. Persephone herself is considered a fitting other half to Hades because of the meaning of her name which bears the Greek root for "killing" and the -phone in her name means "putting to death". While Hermes did not primarily reside in the underworld and is not usually associated with the underworld, he was the one who led the souls of the dead to the underworld. In this sense, he was known as Hermes Psychopompos and with his fair golden wand he was able to lead the dead to their new home. He was also called upon by the dying to assist in their passing – some called upon him to have painless deaths or be able to die when and where they believed they were meant to die. Minos, Rhadamanthus, and Aeacus are the judges of the dead. They judged the deeds of the deceased and created the laws that governed the underworld. However, none of the laws provided a true justice to the souls of the dead, and the dead did not receive rewards for following them or punishment for wicked actions. Charon is the ferryman who, after receiving a soul from Hermes, would guide them across the rivers Styx and/or Acheron to the underworld. At funerals, the deceased traditionally had an obol placed over their eye or under their tongue, so they could pay Charon to take them across. To the Etruscans, Charon was considered a fearsome being – he wielded a hammer and was hook-nosed, bearded, and had animalistic ears with teeth. 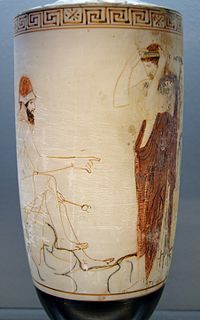 In other early Greek depictions, Charon was considered merely an ugly bearded man with a conical hat and tunic. Later on, in more modern Greek folklore, he was considered more angelic, like the Archangel Michael. Nevertheless, Charon was considered a terrifying being since his duty was to bring these souls to the underworld and no one would persuade him to do otherwise. Cerberus (Kerberos), or the "Hell-Hound", is Hades' massive multi-headed (usually three-headed) dog with some descriptions stating that it also has a snake-headed tail and snake heads on its back and as its mane. Born from Echidna and Typhon, Cerberus guards the gate that serves as the entrance of the underworld. Cerberus' duty is to prevent dead people from leaving the underworld. Melinoe is a chthonic nymph, daughter of Persephone, invoked in one of the Orphic Hymns and propitiated as a bringer of nightmares and madness. She may also be the figure named in a few inscriptions from Anatolia, and she appears on a bronze tablet in association with Persephone. The hymns, of uncertain date but probably composed in the 2nd or 3rd century AD, are liturgical texts for the mystery religion known as Orphism. 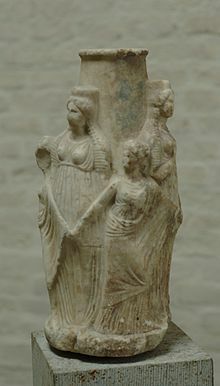 In the hymn, Melinoë has characteristics that seem similar to Hecate and the Erinyes, and the name is sometimes thought to be an epithet of Hecate. The terms in which Melinoë is described are typical of moon goddesses in Greek poetry. 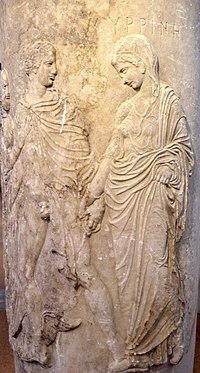 Orpheus, a poet and musician that had almost supernatural abilities to move anyone to his music, descended to the underworld as a living mortal to retrieve his dead wife Eurydice after she was bitten by a poisonous snake on their wedding day. With his lyre-playing skills, he was able to put a spell on the guardians of the underworld and move them with his music. With his beautiful voice he was able to convince Hades and Persephone to allow him and his wife to return to the living. The rulers of the underworld agreed, but under one condition – Eurydice would have to follow behind Orpheus and he could not turn around to look at her. Once Orpheus reached the entrance, he turned around, longing to look at his beautiful wife, only to watch as his wife faded back into the underworld. He was forbidden to return to the underworld a second time and he spent his life playing his music to the birds and the mountains. ^ Long, J. Bruce (2005). Encyclopedia of Religion. Detroit: Macmillan Reference USA. p. 9452. ^ Garland, Robert (1985). The Greek Way of Death. London: Duckworth. p. 49. ^ Fairbanks, Arthur (1 January 1900). "The Chthonic Gods of Greek Religion". The American Journal of Philology. 21 (3): 242. doi:10.2307/287716. JSTOR 287716. ^ Albinus, Lars (2000). The House of Hades: studies in ancient Greek eschatology. Aarhus University Press: Aarhus. p. 67. ^ Mirto, Maria Serena; A. M Osborne (2012). Death in the Greek World: From Homer to the Classical Age. Normal: University of Oklahoma Press. p. 16. ^ Leeming, David (2005). "Styx". The Oxford Companion to World Mythology. Oxford University Press. doi:10.1093/acref/9780195156690.001.0001. ISBN 9780195156690. Retrieved 2 December 2012. ^ Buxton, R.G.A (2004). The Complete World of Greek Mythology. London: Thames & Hudson. p. 209. ^ "Theoi Project: Lethe". Retrieved September 30, 2012. ^ "Underworld and Afterlife - Greek Mythology Link". Maicar.com. Retrieved 2018-04-02. ^ "The Greek Underworld". Wiki.uiowa.edu. 2010-01-31. Retrieved 2018-04-02. ^ Wordsworth, William. Knight, William (edit.). The Poetical Works of William Wordsworth, Volume 6. MacMillan & Co. 1896; pg. 14. ^ Virgil. Fairclough, H. Rushton (trans.). Virgil: Eclogues. Georgics. Aeneid I-VI. Vol. 1. William Heinemann. G.P. Putnam's Sons. 1916. ^ "Theoi Project: Haides". Retrieved December 2, 2012. ^ a b c d O'Cleirigh, Padraig (2000). An Introduction to Greek mythology : story, symbols, and culture. Lewiston, N.Y.: Edwin Mellen Press. p. 190. ^ Peck, Harry Thurston (1897). Harper's Dictionary of Classical Literature and Antiquities. Harper. p. 761. ^ Leeming, David (2005). "Demeter and Persephone". The Oxford Companion to World Mythology. Oxford University Press. doi:10.1093/acref/9780195156690.001.0001. ISBN 9780195156690. Retrieved 2 December 2012. ^ Pfister, F (1961). Greek Gods and Heroes. London: Macgibbon & Kee. p. 86. ^ "HECATE : Greek goddess of witchcraft, ghosts & magic; mythology; pictures : HEKATE". Theoi.com. Retrieved 2012-09-24. ^ d'Este, Sorita & Rankine, David, Hekate Liminal Rites, Avalonia, 2009. ^ "Theoi Project: Erinyes". Retrieved October 8, 2012. ^ "Theoi Project: Kharon". Retrieved December 2, 2012. ^ "Cerberus". Merriam-Webster Online Dictionary. Merriam-Webster. Retrieved 2009-07-16. ^ "Yahoo! Deducation". Archived from the original on 2012-10-21. ^ Cerberus definition - Dictionary - MSN Encarta. Archived from the original on 2009-10-31. ^ Jennifer Lynn Larson, Greek Nymphs: Myth, Cult, Lore (Oxford University Press, 2001), p. 268. ^ Radcliffe G. Edmonds III, "Orphic Mythology," in A Companion to Greek Mythology (Blackwell, 2011), note 58, p. 100; Apostolos N. Athanassakis, The Orphic Hymns: Text, Translation, and Notes (Scholars Press, 1977), p. viii. ^ Edmonds, "Orphic Mythology," pp. 84–85. ^ Ivana Petrovic, Von den Toren des Hades zu den Hallen des Olymp (Brill, 2007), p. 94; W. Schmid and O. Stählin, Geschichte der griechischen Literatur (C.H. Beck, 1924, 1981), vol. 2, pt. 2, p. 982; W.H. Roscher, Ausführliches Lexikon der griechischen und römischen Mythologie (Leipzig: Teubner, 1890–94), vol. 2, pt. 2, p. 16. ^ Georg Autenrieth. "Τάρταρος". A Homeric Dictionary. Retrieved 7 April 2012. ^ Mikalson, Jon D (2010). Ancient Greek Religion. Chichester, West Sussex: Wiley-Blackwell. p. 177. ^ Mystakidou, Kyriaki; Eleni Tsilika; Efi Parpa; Emmanuel Katsouda; Lambros Vlahos (1 December 2004). "Death and Grief in the Greek Culture". OMEGA: Journal of Death and Dying. 50 (1): 24. doi:10.2190/YYAU-R4MN-AKKM-T496. Retrieved 4 December 2012. ^ Hamilton, Edith. "The Story of Orpheus and Eurydice". Retrieved December 2, 2012. Albinus, Lars (2000). The House of Hades: Studies in Ancient Greek Eschatology. Aarhus: Aarhus University Press. Buxton, R (2004). The complete World of Greek Mythology. London: Thames & Hudson Ltd.
Camus, Albert. "The Myth of Sisyphus". Retrieved 3 December 2012. Fairbanks, Arthur (1900). "The Chthonic Gods of Greek Religion". The American Journal of Philology. The Johns Hopkins University Press. 21 (3): 241–259. doi:10.2307/287716. JSTOR 287716. Garland, Robert (1985). The Greek Way of Death. London: Duckworth. Leeming, David (2005). "Demeter and Persephone". The Oxford Companion to World Mythology. Oxford University Press. doi:10.1093/acref/9780195156690.001.0001. ISBN 9780195156690. Retrieved 2 December 2012. Leeming, David (2005). "Styx". The Oxford Companion to World Mythology. Oxford University Press. doi:10.1093/acref/9780195156690.001.0001. ISBN 9780195156690. Retrieved 2 December 2012. Long, J. Bruce (2005). "Underworld". Encyclopedia of Religion. Macmillan Reference USA. 14: 9451–9458. Mirtro, Marina Serena (2012). 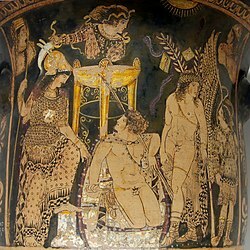 Death in the Greek world : from Homer to the classical age. Norman: University of Oklahoma Press. Mikalson, Jon D (2010). Ancient Greek Religion. West Sussex: Wiley-Blackwell. Mystakidou, Kyriaki; Tsilika, Eleni; Parpa, Efi; Katsouda, Elena; Vlahous, Lambros (2004–2005). "Death and Grief in the Greek Culture". Omega. Baywood Publishing Co. 50 (1): 23–34. doi:10.2190/yyau-r4mn-akkm-t496. O’Cleirigh, Padraig, Rex A Barrell, and John M Bell (2000). An introduction to Greek mythology : story, symbols, and culture. Lewiston: Edwin Mellen Press. Peck, Harry Thurston (1897). Harper's Dictionary of Classical Literature and Antiquities. Harper. Pfister, F (1961). Greek Gods and Heroes. London: Macgibbon & Kee. Scarfuto, Christine. "The Greek Underworld". Retrieved 3 December 2012. Schmiel, Robert (1987). 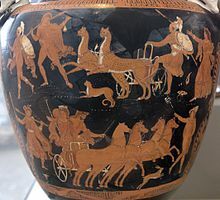 "Achilles in Hades". Classical Philology. The University of Chicago Press. 82 (1): 35–37. doi:10.1086/367020. JSTOR 270025.